The history of the Jews in Jamaica predominantly dates back to migrants from Portugal and Spain to the island since 1494. The first Jews came to the island during the Spanish occupation of the Island, 1494-1655. These Jews came from Spain and Portugal. They fled because of the Spanish inquisition. To conceal their identity they referred to themselves as "Portuguese" or "Spanish" and practiced their religion secretly. At the time of the British conquest of the island in 1655, General enables recorded the presence of many "Portuguese" in Jamaica. The Jews were allowed to remain after the conquest and began to practice their religion openly. They were granted British citizenship by Cromwell and this was confirmed in 1660 by King Charles. They attained full political rights in 1831. The status of British citizenship enabled ownership of property by the Jews. Jamaica's Jewish population was never large. However their contribution to the economic and commercial life of the nation outstripped that of any other group of comparable size in Jamaica. It was formerly believed that only 200 people were religiously practising Jews in Jamaica and that most Jews had migrated out of Jamaica. A recent study has now estimated that nearly 424,000 Jamaicans are descendants of Jewish (Sephardic) immigrants to Jamaica from Portugal and Spain from 1494 to the present, either by birth or ancestry. Jewish documents, gravestones written in Hebrew and recent DNA testing have proven this. While many are non-practicing of Judaism, it is recorded that over 20,000 Jamaicans religiously identify as Jews. Common Jewish surnames in Jamaica are: Abrahams, Alexander, Isaacs, Levy, Marish, Lindo, Sangster, Da Silva, De souza, DeCohen, Barrett, Babb, Magnus, Codner, Decosta, Henriques and Rodriques. The Chabad-Lubavitch movement opened a branch in Jamaica in 2014 servicing locals as well as a welcome centre for international visitors. Books: Mordechai Arbell-The Portuguese Jews of Jamaica. Jamaica was a Spanish colony from 1494 to 1655. During that period, there was a constant stream of Conversos from the Iberian peninsula, mainly from Portugal. The British occupation enabled these covert Jews to return to Judaism. In the 17th and 18th centuries, the Jews controlled the sugar and vanilla industries and played a leading role in foreign trade and shipping. In the 19th century, they were prominent in the political, social, and cultural life of the country. In 1849, for example, 8 of the 47 members of the House of Assembly were Jews, and the House adjourned for Yom Kippur. In 1881 the Jewish population reached 2,535 out of 13,800 white citizens. In the 20th century, Jews from Syria and Germany joined the community. However, the Jewish population diminished due to economic decline, emigration, and intermarriage. The various communities amalgamated to form the United Congregation of Israelites, which is mixed Sephardi-Ashkenazi. There is only one functioning synagogue, but the community also maintains a school called the Hillel Academy and a home for the aged. Chapters of WIZO and B'nai B'rith also exist. Israel and Jamaica enjoy full diplomatic relations. Israel is represented by its ambassador in Santo Domingo (Dominican Republic). 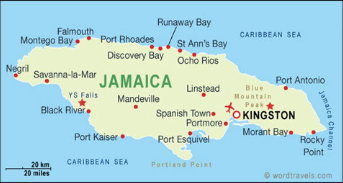 Jews settled all over Jamaica, and there were synagogues in Kingston, Spanish Town, Port Royal, and Montego Bay. The ruins of many of these can be visited, as can 14 Jewish cemeteries. KINGSTON, Jamaica — The first ordained rabbi in 40 years to serve the Shaare Shalom Synagogue of Kingston, Jamaica, has attracted to his conversion classes candidates who include descendants of its once much larger and thriving population. Formerly with a congregation in Georgia, Rabbi Dana Evans Kaplan now leads worshipers at the Dutch and Sephardic synagogue, a whitewashed structure with sand floors in Old Kingston. A graduate of Jerusalem’s Hebrew Union College with a PhD in Jewish History from Tel Aviv University, he took his new pulpit last September. Kaplan is no stranger to either the conversion process or to the Caribbean, as his doctoral thesis was on conversion to Judaism in early America, and he has written about Cuban Jewry. Before his arrival, services and classes had been led by congregants, including Stephen Henriques, a descendant of an old Jamaican Jewish family. There were also conversion ceremonies. “While Stephen had no formal training, he was very enthusiastic and extremely dedicated. I don’t know what percentage of the people he taught are still attending our synagogue, or still practicing Judaism somewhere else, but I would imagine it would be quite high,” said Kaplan, who added that some converts also led services. Kaplan and the synagogue are now formalizing the process of conversion, which it calls simply “Giur,” Hebrew for “conversion.” The synagogue’s beit din, or rabbinical court, interviewed 15 people and admitted 14, including three who will likely have a formal conversion later this year. One applicant chose to opt out for personal reasons. “Obviously we only brought people to the beit din who had been coming to synagogue for quite a while. We had a reasonable expectation that they were ready. Some had been coming for as long as 11 years,” said Kaplan. The rabbi expects future candidates from among others currently attending services. Kaplan adds that some of those undergoing conversion “have a Jewish background, but fairly far back. We accept patrilineal descent, so someone with a Jewish father and Christian mother would not have to convert as long as they were raised Jewish. The roots of the UCIJA’s Shaare Shalom can be traced back to synagogues in nearby Port Royal that were devastated by an earthquake in 1692, and later in the inland British capital of Spanish Town. Many of the Jews who perished are buried across the harbor from Port Royal at Hunt’s Bay Cemetery, which has been restored and surveyed. Shaare Shalom was rededicated in 1912 after being rebuilt on its present site following earthquake damage of 1907. The UCIJA was formed in 1921 and the property surrounding the synagogue today includes a Jewish Heritage Center and a memorial garden whose tombstones date back to the 18th century. On Monday nights the synagogue’s Jewish Home, now called Miriam House, hosts an Adult Information Program which has been focusing on prayers and holidays. One conversion student is Carol Lawton whose family has been in Jamaica over 150 years. He readily admits he’s “not the best student” in the Giur program. He describes himself as “very secular in outlook” and says that most of his family assimilated over the last 40 years and intermarried. “But the Jewish traditions hold water,” he said. “My family were Ashkenazim at the time. Now we share traditions. We Jamaicanized the different streams,” he said. Lawton says the classes allow him “to reconnect deep with my Jewish heritage which will better enable me to pass on our traditions to the next generation to come.” He especially notes that he’s improving his knowledge of Hebrew. Gloria Hartwick (not her real name) was born into a family with Jamaican roots going back to the 1600s. Her Jewish grandfather married a Roman Catholic and her father was raised as a Catholic. Her mother’s great-grandmother was Jewish and married a Catholic and the subsequent generations, including her own, were Catholic as well. She also attended a Catholic high school. “Up until 2009, I was a practicing Catholic. After the death of my father, I walked away from the church. In my mind, the values and ethics were not in sync with my current ideology. It literally felt like I was swimming against the current, i.e., upstream,” Hartwick explained. She began to study. She points to the rabbi’s adult educational talks as well as one-on-one discussions with him and other members of the congregation as leading to her decision. 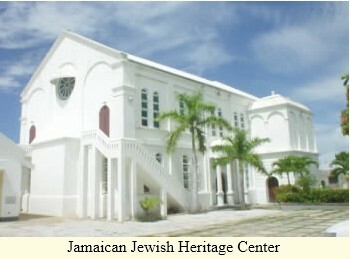 The Kingston synagogue has a mix of influences, creating a unique Jamaican Judaism. In 1655 the English captured Jamaica. The island had been in the possession of the Colon family who were descendants of Christopher Columbus. By securing this important foothold in the Caribbean, The British were in reach of the Spanish fleets of gold and silver that sailed from the Spanish mainland. The English soon set about fortifying the large natural harbour now known as Kingston harbour. These activities together with the lenient Protestant policies of the Cromwell-led government in England allowed other religions to be practiced freely (and this included Judaism) and encouraged our Jewish ancestors to immigrate to Jamaica. They began to arrive 350 years ago. They were mainly Sephardim, Spanish and Portuguese Jews. Some were expelled in 1492 at the same time that Columbus sailed from Spain for his encounter with the New World. Others later foreswore their Converso guise, re-embracing the beliefs of their forefathers and fled from the Inquisition. Now 350 years later, we recognize that our ancestors came from the fires and torture racks of the Inquisition, the blood baths of the pogroms, the uncertainties caused by the breakup of the Ottoman Empire and even later from the gas chambers and the ovens of Europe. They came to Jamaica where we found tranquility and the ability to worship as Jews, to practice Judaism in peace. After 350 years of rich Jewish life in our island home a special service of thanksgiving service was made in which a young tree of life, a Lignum Vitae sapling was planted, We prayed that it will be nurtured, as we have been to reach this occasion. We have officially opened the rest of the Jamaican Jewish Heritage Center, whose foundations are based on these past 350 years. The celebration of 350 years of the freedom to practice the beliefs of Judaism in a country is only equaled in the world by congregations of Jews in four other nations: Curacao (under the Dutch and now independent); New York, (then New Amsterdam, under the Dutch then under the English and now part of an independent nation, the USA); Britain in London, under Cromwell and then under the return of the Monarchy, and India. And last there is Jamaica, as a Monarchy, as a Crown Colony and now as an independent nation. Such is this rare achievement of the Jamaican people. The celebration we made was for all of us, Jew and Gentile, all of us together; for this we gave and give thanks. There are many stories that could be shared as to our history, our achievements, our contributions to our national life, how and why and where we worshiped, where we lived, worked, died and buried our dead in more than a dozen cemeteries in the island. There are so many stories woven into the fabric of our rich national heritage - some of these stories adorn the walls of the permanent exhibition that was opened. The story that must continue to be shared is the wonderful way as humans that we, the people of Jamaica, have each kept our beliefs and at the same time interacted as people, separate as people are, as individuals, yet drawn together by love, by business, by community, by friendship, by service to each other, by hardship and calamity and by just being people. It is a story that we must continue to regard, cherish and often repeat, not one to take for granted because Jamaicans are an example to rest of the world to follow, especially as we see the rise of intolerance across many lands resulting in the death of innocents in new genocides almost daily. These past 350 years have had their struggles. The road through time has had its pot holes too but working on them has not been in vain, most have been filled, or circumvented, and have allowed us to reach this milestone. In the words of Marcus Garvey and other sages we have understood that we must know our history. Thankfully we can report that in recent years we have had published some of our great Jewish Jamaican history, which if future generations peruse, then they will not allow earlier mistakes to be repeated. And to ensure that there will be material for research for our historians of tomorrow we have created in this Heritage Centre our archives, to augment the national Archives, as a resource base for their work. These archives, the reference library and our Family History centre is available to all, whether from here or elsewhere, these are resources which we are willing to share regardless of the truths that they carry between their covers. Our sages tell us of Tzedik, (giving back), the responsibility of a people to build a better society. To this end all Jamaica and indeed the world will now understand that to have created the Jewish Heritage Center is therefore not just an expression of our ego but a real way of thanksgiving, of saying to all, thank you to all of Jamaica, for all have too been a part of the heritage. We want young Jamaica in particular to tour, to visit and experience both the heritage and also the study of Judaism, not for conversion, but for the understanding of what another's beliefs are, an understanding that will continue the respect that we each must have for the other, a part of their curricula and also a part of their socialization that is being denied in many other parts of the world, especially to the young. We want our adults, from all across Jamaica, to come and see and learn about this heritage, some of which may have had its roots in their village, district or town. We want them to rejoice too with reality of their Spanish and Portuguese names, their genes where there is ancestry, and the customs enshrined in our culture, much as yet undefined. We want the visitors to our island home to recognize, to see, to experience, that we are, as the some of the Jamaica Tourist Board advertisements state, we are more than a beach, we are a country, a country with a past, a history, roots, that most of them cannot match, yet we still keep hidden from ourselves. No more! The challenge is that all must come out of the closets of their own makings, to put each of your hands and heart into telling your stories, putting them in places to be shared with each other and with us and to be proud of who we all are, how we have lived together in this plural society, how we have created a nation not just out of many, one but out of many cultures, one culture. These will become the paving stones on our national road to peace. In achieving the development of the centre there were tributes to those who helped, who contributed their time and their resources, their skills and their talents, and to the Wardens, Directors and members of the congregation who both contributed resources and allowed their hall and grounds to be used for these purposes as well, and in particular to the CHASE fund, a truly important national philanthropic entity, without whom there would have been no centre. The hope is that we continue to live as one people, with respect for each other only more so.